« Ah, the Rumor Mill. It’s a Churnin’! This past Sunday was Christmas Day, PML-N leader Nawaz Sharif‘s birthday, and the 135th birth anniversary of Mohammed Ali Jinnah, the father of Pakistan. This past Sunday was also Pakistan Tehreek-e-Insaf (“Movement for Justice”)’s much-anticipated political rally in Karachi. For those of us not physically at the Minar-e-Quaid (Jinnah’s Mausoleum), the PTI jalsa was cause to gather at friends’ houses, tweet feverishly, and offer sideline commentary to no one in particular. Or maybe that was just me. The PTI attracted mostly urban educated professionals, but failed to get a mainstream following. In fact, in the 2002 parliamentary elections, Imran Khan was the only candidate from his party to win a seat…But now Khan has managed to mobilize enough young urban professionals to become a rising political force. In the past, this demographic shunned politics as a dishonorable activity. But young people are coming out now out of frustration with the current leadership. Ah, the psychological underpinnings of hope and change. We saw it work with the Obama 2008 presidential campaign, and leveraged again by Afghanistan’s Abdullah Abdullah during his recent presidential run. It’s the promise of something different. And though it may just be semantics, words like hope and change induce positive associations with absolute ideals of happiness, progress, and prosperity. For a fatigued and frustrated Pakistani populace, that is a fuzzy but welcome option. I don’t claim to be an expert on our political system (I actually don’t claim to be an expert on anything), but I have been fascinated with the perceived rise of PTI & Imran Khan in recent months. Here are a few observations both on the lead-up to the December 25th jalsa, the rally itself, and subsequent reactions post-rally. PTI Snakes on a Plane: You have to give it to Tehreek-e-Insaf. They know how to market their vision to urban masses & millennials alike. Prior to the Dec 25th jalsa, the party generated buzz by launching a telemarketing scheme akin to Snakes on a Plane (if you received a phone call from Samuel L. Jackson telling you about those mother**** snakes on the mother**** plane, then you know what I’m talkin’ about). Many Karachiites received a 30-second phone call from Imran Khan inviting them to the rally. Although the call was pre-recorded, many almost believed they were receiving a personal call from the man himself. Insert swoons here. The strategy is a reflection on the party’s overarching marketing approach – the use of choice words (hope, change & the like), leveraging social media, telemarketing all enforce a broader theme: Imran Khan & PTI offer something new, something approachable, something hip, something different from the status quo. Imran Khan Cricket Hero, Imran Khan Politican = Same, Same: I don’t think I’ve ever heard so many cricket analogies. Oh my goodness. In a BBC interview prior to the jalsa he noted, “It’s like playing a World Cup final…this could be a defining moment in Pakistan.” In the lead-up to the rally, Imran reportedly called PML-N chief Nawaz Sharif a club cricketer “flexing muscles with a Test cricketer.” The list goes on. And while I think cricket & “tsunami” references could form its own drinking (coke! hee!) game, the analogies further raise positive associations of Imran circa 1992 World Cup. Imran the politician + Imran cricket hero = Imran heroic politician. PTI – Stragglers Welcome: Ahsan over at Five Rupees had a great post on the politicians who have crossed over from their own parties to join PTI, and what it all means: “…when the potential for success for [insert party here] ticket goes down, and PTI’s chances of success go up, we’re more likely to see politicians from [insert party here] to leave for the PTI,” though this may not be the case for MQM or Jamaat-e-Islami (JI). The new additions to PTI are relative heavyweights, including Javed Hashmi from PML-N & Shah Mehmood Qureshi from PPP. Before watching the jalsa, I thought they were sure to help PTI’s clout. But then I watched SMQ talking like a wannabe Shakespeare (community) theater actor about nuclear policy during the rally, and am now grumpy and undecided. Insecurity is the Best Form of Flattery: You can tell other political parties (namely the PPP & PML-N) are beginning to feel threatened when they start resorting to petty mudslinging and banding together. PM Gilani, who reportedly also made a statement that Zardari was actually younger than Imran, also told media outlets, “Those people who are talking of revolution – are there any new people among the revolutionaries or are they mostly those who wanted to bring revolution along with Musharraf?” Curiously absent from those critiques – the MQM. Curious indeed. 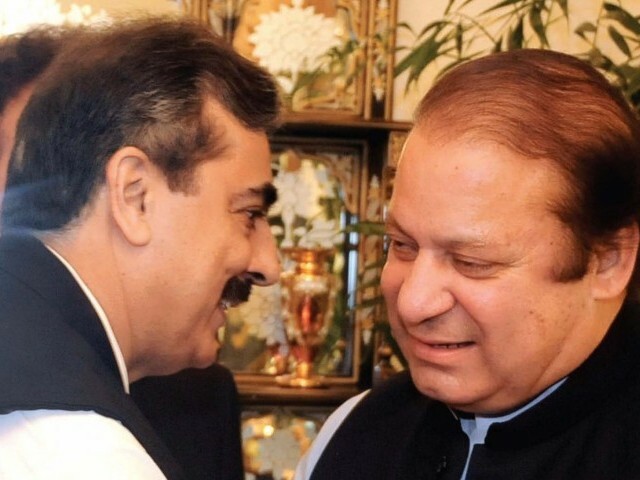 (Express Image) Gilani: Bhai, your plugs may need some sprucing up. Look who we're up against. Nawaz: Curse those gorgeous locks of hair. Curses! Don’t get me wrong. I’ve been impressed with the perceived meteoric rise of Imran & his party. His speech, especially in comparison with the other speeches at the jalsa, was powerful & hit all the right notes – from wishing Pakistani Christians a Merry Christmas to addressing the Balochistan issue. And though the PTI Manifesto can and should be a better representation of how PTI aims to do much of what they promise (including, ahem, ending corruption in 90 days! Eee! ), I do think Imran has steadily moved away from the days where he stood against everything and for nothing. Does that mean I still have my reservations? Hell yes. Does he really have the establishment on his side and what ramifications will that hold? What does an Islamic Welfare State mean in reality? What does all of this mean in reality? Every political leader in our country has set out to prove that they can undertake the ideals laid out in Jinnah’s vision. Every leader makes vague promises, tugs on our heart strings that this time, dear citizens, they will be different. The difference with Imran is that he is an option we have not tried before. Does that merit my vote? I’m still undecided, but at least his campaign has spurred me to vote. You should too. I think you wrote what was in my heart!! I was at karachi and attend this Tsunami. It was huge and lots of ppl were there, But mostly pathans and now i sometime thinks what will happened if PTI wins, Will they provide us support from pathan’s ? If we want to change Pakistan , we need to support PTI (Imran Khan) and bring him to power. All other parties leaders are tested multiple times and we know they can’t bring a change, mainly because as Imran Sab said they are part of the problem, not part of the solution. If we have a fair leader on top, like Imran Khan, he can fix corruption and other bad governance issues. IK said lately that his cabinet will not include more than 20 ministers, right now we have almost 100 ministers, costing our country a lot of money. I strongly believe that its our time now for change and I also understand others like Obama used the word “change” but when he came into power he continued the previous gov policies. In fact he escalated the war and spent more money than Bush. But that does not mean Imran khan will also keep on running the country like it is now. He is a committed person, very hardworking, and he will set his own example for the rest of the party to follow. InshAllah good days are coming for Pakistan soon!